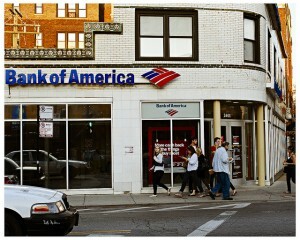 Since reporting earnings Wednesday morning, Bank of America Corp (NYSE:BAC) lost 6.5% through trading yesterday. The initial response to B of A’s earnings was largely negative due to reported revenue that missed expectations — even though continued improvements in the bank’s operations resulted in quadrupled earnings. The bank opened 1% higher this morning, giving some hope to the possibility of regaining some of the traction it’s lost in the past two days, but quickly fell within minutes of the opening bell. As of 10:15 a.m. EDT, Bank of America is sitting at a 0.8% gain. This earnings season hasn’t been very favorable for the big four banks, with many investors being disappointed in underlying data points that caused improvements in earnings to be largely set aside. This was the case last week for both JPMorgan Chase & Co. (NYSE:JPM) and Wells Fargo & Co (NYSE:WFC), which both reported record first-quarter earnings. However, both banks reported softening in the mortgage market, leaving investors with doubts about revenue growth for future quarters. Bank of America Corp (NYSE:BAC) reported an improvement in its mortgage origination operations, though it missed analyst expectations for revenue, which generated the same response from investors, leading to a big drop over the past two days. But while there are many voices asserting displeasure in BAC’s report, there are an equal number citing vast improvements in the bank’s operations and underscoring the importance of looking beyond what analyst expect. Fueling this morning’s drop may be something other than continued investor disappointment in the bank’s earnings — insurer American International Group Inc (NYSE:AIG) has just won an important fight in the continuing legal battle against Bank of America Corp (NYSE:BAC). In a suit filed back in August of 2011, AIG is seeking damages for losses caused by mortgage-backed securities sold by B of A’s Countrywide and Merrill Lynch segments. The insurer contends that Countrywide and Merrill Lynch misrepresented the securities, leading to AIG’s losses. This morning, a federal appeals court overturned a prior ruling blocking the transfer of the case to a New York State court, which AIG argues is the correct venue for the case. This is a big win for AIG as the delay in this case was largely due to this issue. If American International Group Inc (NYSE:AIG) wins the case overall, Bank of America may have to pay up to $10 billion in claims related to the $28 billion in securities sold to AIG.